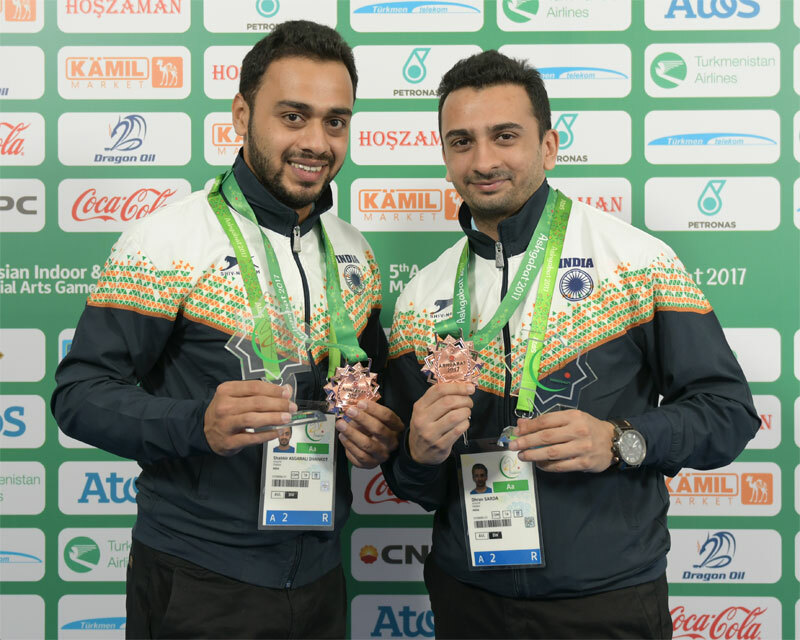 Shabbir Dhankot and Dhruv Sarda of India won bronze medal in Men’s Doubles at the 5th Asian Indoor and Martial Arts Games currently underway in Ashgabat, Turkmenistan. Shabbir (181) and Dhruv (237) of India defeated Kenneth Chua (224) and Jo-mar Jumapao (182) of Philippines 418 — 406 by 12 pins in the Quarter finals. In the Semi-finals Shabbir (178) and Dhruv (187) lost to Cho- Young – Seon ( 226 ) and Kang He Won of Korea (232) by 93 pins to bag the bronze , India ‘s first ever medal for the sport of Tenpin Bowling in 5 editions of Asian Indoor Games. Cho – Young – Seon and Kang He Won of Korea went on to win Gold defeating another Korean pair of Choi Bok Eum and Kim Kyung Min by 52 pins (434- 382). In the Qualifying rounds, Played on long oil conditions, Shabbir (1355) and Dhruv (1215) pair had fiinished overall 5th scoring 2570 pins to qualify for Top 8 Knock out rounds. Akaash Ashok Kumar and Parvez Ahmed finished 17th. In the Singles Shabbir( 1342) missed the Cut for Top 8 by 12 pins and Dhurv Sarda ( 1326) by 28 pins. Team India comprising of Shabbir Dhankot, Dhruv Sarda, Akaash Ashok Kumar and Parvez Ahmed will be competing in the qualifying rounds Team of 4 event to be held tomorrow. good show by the indian tenpin bowlers. they have come a long way with the help of TBFI secretary Mr. kannan and the coach Andrew frawley. wish they get gold in up coming events.